The digital market in Southeast Asia continues to witness blistering growth on the back of rapid smartphone proliferation. Internet penetration has also seen a steady rise and ranges from just over 40% in Indonesia to over 80% in Singapore. With a population of over 650 million across the region, businesses across industries have woken up to the immense potential the entire market holds, especially through digital channels. With an eye firmly on the future, we at CleverTap recognize the significance of a high-growth market such as Southeast Asia and continue to empower leading regional brands in their quest to drive higher user engagement, and retention driven by advanced consumer insights. 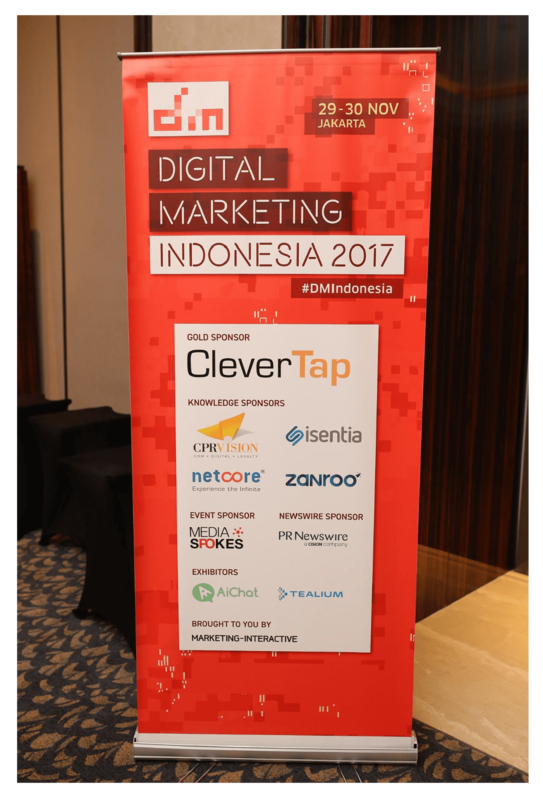 Set in this backdrop, CleverTap participated at the Digital Marketing Indonesia, 2017 conference in Jakarta on November 29-30th. 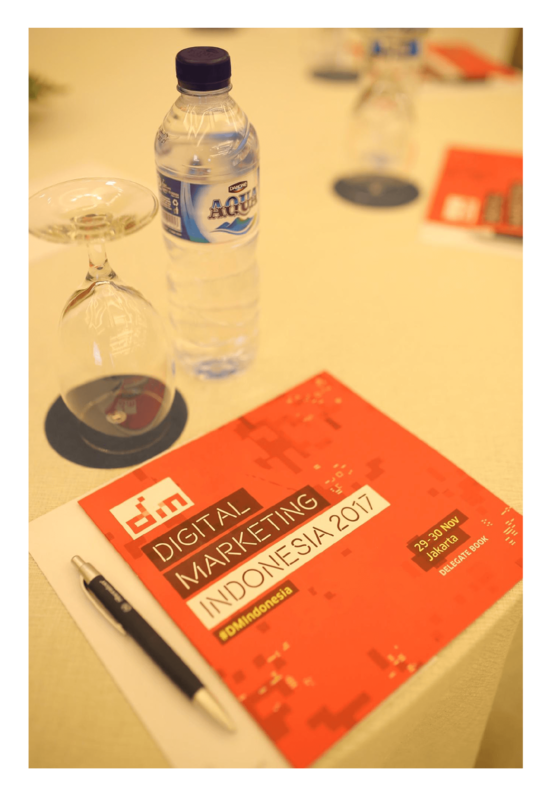 The agenda of DMI, 2017 touched upon some of the hottest digital marketing trends and tactics – including the significance of a mobile-first approach, data-driven marketing, geolocation targeting, user-generated content, and blockbuster engagement strategies. Our very own Product Evangelist – Jay Dalvi – spoke about the key ingredients essential to creating a mobile growth recipe primed for success in a presentation titled “Mobile Marketing 2020”. The well-received session offered the engaged 250+ audience intelligent insights into the advantages of being mobile-first in an increasingly connected world and how CleverTap can help mobile marketers bridge the engagement gap with users across the entire user lifecycle through contextual personalization at scale. There were other quality talks delivered by leading personalities in the digital sphere from the region. Day 1 saw Rizkie Maulana Putra, Head of E-Commerce, L’oreal Indonesia, encouraging businesses to embrace mobile as a major purchase and engagement touchpoint. 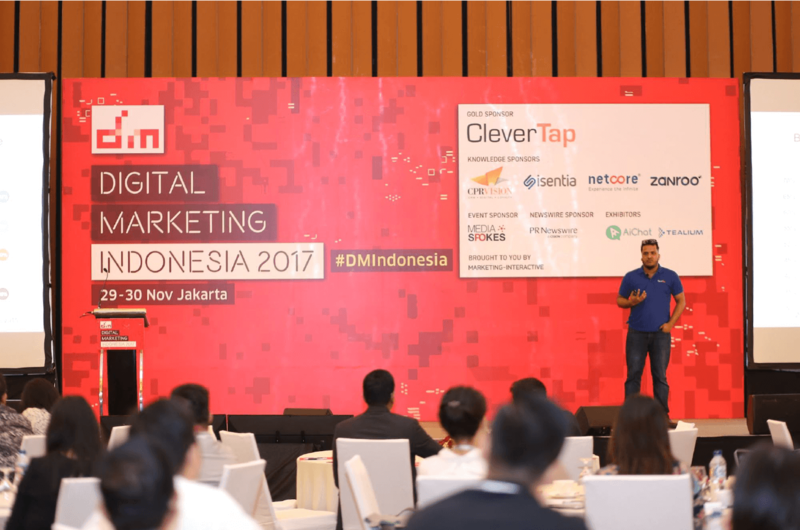 Hermanto, Digital Marketing Manager, Samsung Indonesia, discussed key strategies to up one’s video advertising game across digital platforms in order to create greater monetization channels. Cameron Richards, CEO, CPR Vision, spoke about the pressing need for businesses to leverage the vast quantities of digital data available at their disposal to enable better decision-making. Day 2 saw Christoph Choi, MD, Porsche, enlighten the audience about the latest trends driving online engagement in the automotive industry while Antonius Susanto of Microsoft Indonesia highlighted the increased use of machine learning in business decision-making today. Myljoy Polestico, MD, Zanroo, touched upon the value of social media listening to both B2C and B2B businesses. Over the course of both the days, CleverTap continued to create a great deal of buzz at its booth on the exhibition floor, engaging in stimulating conversations with delegates from leading regional brands. 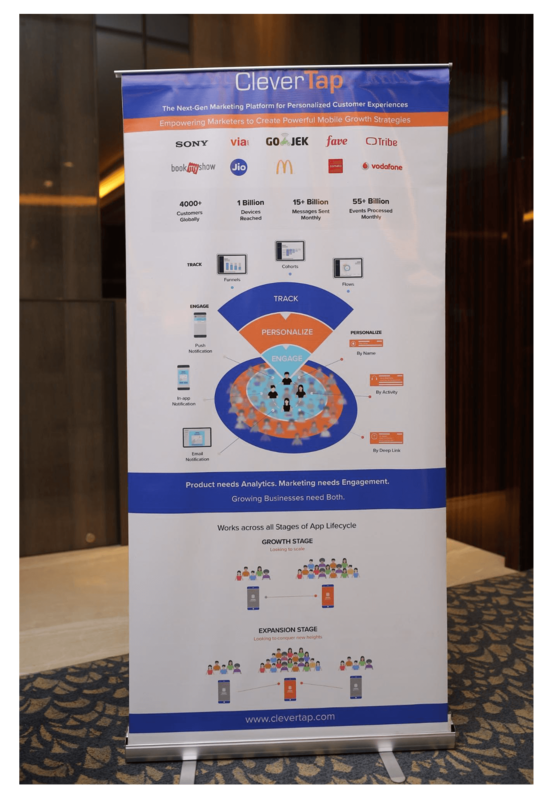 We educated, informed and addressed queries on how our intelligent mobile marketing platform driven by real-time behavioral insights can help both web and app businesses run highly targeted omni-channel user engagement campaigns. This was an amazing experience to meet so many mobile experts and see how we can share knowledge to make the mobile marketers life easier. Over 4000 leading global brands such as Sony, McDonalds, and DealsPlus trust us with their marketing automation. Learn how CleverTap can help you unlock the true potential of your mobile app business by scheduling a demo with us today!